When a few of us from the Bulls office first met with Sam Smith to discuss what Hall of Fame content we had planned, he told us not to do anything. Well, almost. “Just put a picture of me up on the site and say, ‘If this guy can get into the Hall of Fame, then so can you,’” he cracked. We laughed and assured him we’d do more than that. But when you get to know Sam and his story, what he said rings true. Growing up, he wasn’t any better off than millions of other middle class Americans. He was far from a model student. And by the time he did finally break into journalism, he wrote about local politics, not sports. It was a far cry from the career he would eventually have, one that saw him covering one of sport’s greatest dynasties and landing on the New York Times bestseller list with a book he authored at the beginning of the Bulls’ championship run. Now, as Smith prepares to receive the 2012 Curt Gowdy Media Award from the Naismith Memorial Basketball Hall of Fame, we take a look back at his journey. Samuel Pritzker Smith was born on January 24, 1948 in Brooklyn, New York. Smith, pictured above with his father, Leon, and mother, Betty, as he grew up in Brooklyn during the early 1950s. Smith’s grandfather was a Jewish orthodox rabbi in Kiev before his family was forced out of Russia in the mid-1920s. They relocated to the United States and with that came a new name, which was doled out at Ellis Island. Sam’s father worked as a clerk at the U.S. Post Office for 35 years in downtown Brooklyn and he usually had a second odd job to make ends meet. It was common for Leon to work six days a week, 16 hours per day, which meant Sam didn’t get to see him all that often. Meanwhile, Sam’s mother worked as a secretary around the neighborhood in order to remain close to home. Sam, his parents and his sister, Sherry, resided in apartment building in Brooklyn’s East New York neighborhood before later moving to a row house in Mill Basin, a nicer part of town, when he was eight years old. Though he’s not religious now, Smith was raised in a very religious home and attended Hebrew school for five years. It was a comfortable upbringing, recalled Smith, very typical of so many other middle class families. Much to his displeasure, however, Smith was pushed by his parents to get a job at a young age. When he was 11 years old, he unofficially got his start in the newspaper business, delivering the World Telegram each day, as well as the Daily News and Mirror on Sundays. Along the way, Smith developed a very independent personality, and when he wasn’t at school or working, he enjoyed playing sports. Baseball was his first choice, but he went along with whatever the season dictated—basketball, track, and even bowling. Sam bowled his first 200 game when he was just 11 and a few years later, some of the older guys from the neighborhood would take him around to various alleys and bet on his abilities. He was a ringer—after all, who would think a scrawny little kid could have such talents? But for Smith, it came easy; he saw it as an extension of baseball, where he had a lot of success pitching and playing shortstop. Smith’s favorite baseball memories date back to the summer of 1954, when, as a six-year old, he loved watching the “Say Hey Kid,” Willie Mays. While the majority of his friends around the neighborhood favored the Brooklyn Dodgers, Smith prided himself on collecting cards of Mays and his New York Giants teammates. “You couldn’t have an argument if you were all for the same team,” said the contrarian Smith. It was around 1961 when Smith began taking advantage of a program for students where a balcony seat at Madison Square Garden cost only 50 or 75 cents. He was a regular on Tuesday nights, when NBA doubleheaders featured some of the game’s greats—Wilt Chamberlain, Bill Russell, and Smith’s favorite, Oscar Robertson. Though his passion for sports was growing by the day, he didn’t have the same enthusiasm for his academic endeavors. Smith began to take his studies a little more seriously around the time he began paying his own way at nearby Pace University. He played baseball and bowled there, but most importantly, he finally obtained a little clarity about life after college. While attending Pace University in New York City, Smith was a member of the baseball team. He also bowled for the school. Dating back to when he was a paper boy, Smith loved reading the newspaper, the sports section in particular. While at Pace in the late 1960s, he made a habit of hanging around the athletic offices with some of the other athletes, and one day, it came up that the student newspaper was looking for a sports editor. The position was a paid one, so he took the job and began writing a column about the school’s various teams. Smith was eager to acquire some formal training to further his budding career in writing, but Pace didn’t offer any journalism courses. Instead, the school newspaper hired a journalism professor from Columbia Journalism School to critique its work. That man, Melvin Mencher, eventually reached out to Smith with some words of encouragement. It was that light bulb moment he so desperately needed. Smith went on to receive an accounting degree at Pace. In order to get established as a young professional, he worked two years at Arthur Young, an accounting firm in the city. But from the day he arrived, Smith hoped to enter the field of journalism eventually, so he kept in touch with Mencher. Since Smith didn’t have any experience aside from the school newspaper, Mencher advised him to attend graduate school. After two years of saving money as an accountant, Smith quit to do just that. He initially had plans to enroll at Kansas University, where Mencher had attended. Coincidently, the late Lacy J. Banks, a longtime Bulls beat writer for the Chicago Sun-Times with whom Smith would eventually be close, also went to Kansas. But just as Smith was about to head to Lawrence, he received a call from Ball State, one of the other schools he was considering. Because of Smith’s business background, he was offered the opportunity to assist Ball State with their publications, and in return, he’d receive free tuition, as well as room and board. So it was off to Muncie, Indiana, where he would earn a master’s degree in journalism. Even though at the time Smith remained greatly interested in sports, his awareness of government and public politics had grown tremendously. So he made his way to Fort Wayne, Indiana, where he was hired as an investigative reporter for the News-Sentinel and began to make a name for himself. One story that stands out to Smith was when he shook up the local political scene with a report that resulted in multiple indictments, a popular mayor ousted from office, and even a staffer punching Smith on election night. Smith visited Utah's Bryce Canyon National Park in 1970. It was around this time that a six-year commitment by Smith as a member of the Army reserves came to an end. He had joined in 1969 while still living in New York, when Vietnam was at its height. Like most people his age, he opposed the war. But serving his country was required, so Smith enrolled, and after six months of basic training in Fort Bragg, North Carolina, he was a member of an infantry unit that was on call if extra troops were needed. As part of his duties, Smith attended a two-week training every subsequent summer during his tenure and performed a weekend of active duty once a month. It was during one of those weekends in 1975 when he met his future wife, Kathleen, who was working part-time as a typist at an armory in the Fort Wayne area. “Apparently, I looked dashing in uniform,” recalled Smith. The couple married in January 1976, but a move out of Indiana preceded the wedding. Smith came to the realization that he wasn’t satisfied working the local political scene; he desired to be at the national level. So the couple packed their bags and moved to the East Coast. “I decided if I wanted to write about politics, I had to be in Washington,” said Smith. Smith made roughly $14,000 annually as an accountant, but was paid only half that when he was hired by the News-Sentinel. Raises had eventually gotten him back to the same level of income he had previously earned, but when he left Fort Wayne he was faced with another significant cut in salary. Prior to working for the Tribune, Smith served as press secretary for Sen. Lowell Weicker, a Republican from Connecticut. At the time, the only job Smith could get in Washington, D.C. was as the first employee with a regional wire service, States News Service, which was comprised of only the two owners before he started. The job paid $125 a week, or a whopping $6,500 a year. But for Smith, the sacrifice in income was worth it for the opportunity. His efforts would pay off. Smith did what many of the national writers were doing; the only difference was that he covered the political scene for a handful of Connecticut and Massachusetts newspapers that couldn’t afford their own Washington bureau. He spent time at the White House covering former President Jimmy Carter’s inauguration and early years in office, and was a regular on the scene at Congress. It was in those years—roughly three and a half total—he got to know Sen. Lowell Weicker, a Republican from Connecticut. Weicker eventually hired Smith as his press secretary, but that would only last for six months until the national job Smith had long coveted presented itself. In 1979, Smith was hired as a member of the Chicago Tribune’s news staff to report on business and local politics. Some of his most memorable stories included covering the 1980 presidential campaign between the incumbent Carter and eventual winner Ronald Reagan, and the assassination attempt on civil rights activist Vernon Jordan. Smith also worked the local political scene and became friendly with one of his Tribune colleagues, David Axelrod. They played on the Tribune’s basketball team together in a league with other writers, researchers and lawyers who worked for the paper. He and Axelrod also shared tickets with a group to watch DePaul basketball during the Mark Aguirre era, as well as several Bulls and White Sox games. While Axelrod was embarking on a career in which he would serve as a political advisor to Bill Clinton and Barack Obama—Axelrod was Obama’s senior advisor and is currently heading his re-election campaign—politics were not in Smith’s long-term plans. Around 1981, an editor at the Tribune designated Smith as the paper’s lead business columnist. And though it was clearly a move up, it didn’t go exactly as planned. Smith stuck with it for about a year, but eventually the Tribune realized, as Smith already had, that the position was not a good fit. While the paper could have given him an opportunity to go back to politics, that may have appeared as a demotion. So Smith was granted the freedom to create his own path, meaning he finally got the chance to give sports a try. Unfortunately, there was not a regular sports position open at the time, so Smith was assigned to the Tribune’s weekly magazine that accompanied each Sunday newspaper. Smith joins Michael Jordan and a few other members of the media at a Bulls bowling party in the late 1980s. One of Smith’s projects included a week on the road with the now defunct Continental Basketball Association. His story focused on Carl Nicks, a 6-1, 175-pound guard from the south side of Chicago who played with Larry Bird at Indiana State. When the team Nicks was on faced the Albany Patroons, Smith got to know the opposing head coach, former Knicks forward Phil Jackson, as well as his assistant, Charlie Rosen. Smith, of course, remembered Jackson from watching him when he played at Madison Square Garden, but it was this timeframe in which he came to realize what a great basketball mind the coach possessed. It was the beginning of a relationship that saw Smith and Jackson keep in touch over the years, with Smith often reaching out to Jackson for quotes on his latest NBA story. The relationship would remain strong while Jackson guided the Bulls to six championships in the 1990’s, and it remains intact to this day. A few years after writing for the magazine, Smith was transitioned to general assignment in sports and he essentially assumed the role of a basketball backup beat writer to Bob Logan and Bob Sakamoto. But it wasn’t just basketball for Smith, as he also covered the Cubs’ run to the National League Championship Series in 1984 and the Bears’ Super Bowl season in 1985, as well as boxing and golf. Smith began covering the Bulls full-time in 1987, which he did through the 1991 title, later splitting duties with Melissa Isaacson. It was at that time that the Tribune created an NBA beat for Smith, but it was a side project that would give him national notoriety and acclaim. As the 1990-91 season approached, Smith foresaw a developing story that couldn’t be properly told in the newspaper—there was too much depth to it and far too many perspectives to consider. Michael Jordan had become one of basketball’s biggest stars, but he had yet to win an NBA championship through his first six seasons. Smith’s goal was to detail the dynamic that existed between the budding superstar and his teammates and coaches with a behind the scenes feel. Smith was also ready to take on a new challenge. He had never written a book, so he figured the time was right to give it a shot. And he quickly learned that his subjects were more willing to give him access knowing an interview was for the book. Influenced by author David Halberstam and The Breaks of the Game, his 1981 book about the Portland Trail Blazers’ 1979-80 season, Smith’s created a detailed account about the events of that year’s Bulls’ campaign. Smith surely would love to rewrite history and say he chose that particular season because he knew Michael Jordan and the Bulls were on the verge of a dynasty, but that simply isn’t true. Rather, there was a lot of uncertainty about whether that Bulls team could indeed become a champion. Throughout the season, Smith stuck around after practice most days and caught up with various coaches and players—Scottie Pippen one day, B.J. Armstrong or Bill Cartwright the next. Back then, when the Bulls practiced at the Multiplex in Deerfield, there were no private areas that were off limits to the media. On many occasions, Smith would chat with players as they lifted weights or stayed late for treatment. At that time, the team traveled commercially, along with the media. As a result, the access was much different for the media, a huge aide in Smith’s efforts. As for Jordan, Smith was in very good standing with the Bulls star as he wrote the book. They played golf from time to time, and once in a while on the road, Jordan would invite Smith and Sun-Times writer Lacy J. Banks to his room for a game of cards. Smith had also developed a positive working relationship with Jordan over the years dating back to when he first visited him during his rookie season at his Deerfield townhome. Smith recalls walking in to find Jordan ironing his clothes, and Jordan explained that he had taken some home economics classes at North Carolina so he’d be ready for such tasks as a bachelor. Whether it was Jordan, Pippen or Jackson, from the beginning, Smith made a point of being up front about his intentions for the book. That season, the Bulls finished with a then-team record 61 wins. It was a pace that wouldn’t slow down in the postseason, which saw Chicago blow past New York and Philadelphia in the first two rounds of the NBA Playoffs. But the arch rival Detroit Pistons, the same opponent that had eliminated the Bulls in three consecutive postseasons, were waiting in the Eastern Conference Finals. Jordan, Pippen and the Bulls swept the Pistons to earn the organization’s first appearance in the NBA Finals, where Chicago would meet Magic Johnson and the Los Angeles Lakers. After dropping Game 1 at the old Chicago Stadium, the Bulls rattled off four straight wins to secure the franchise’s first NBA title. The book, however, was about much more than the games that led to the first of six championships for Jordan and the Bulls. It was about the complex dynamic that existed between the game’s biggest superstar and his teammates. Jordan had been almost an untouchable when it came to media scrutiny or criticism, but that changed with the publication of The Jordan Rules. Smith has covered the Bulls since the mid 1980s, getting to know several of the team's longtime figures including the late Johnny "Red" Kerr, former Bulls center Tom Boerwinkle and current TV play-by-play announcer Neil Funk. Smith’s The Jordan Rules hit shelves a few months after the clinching victory in L.A. and with it came a firestorm. But it was not the only controversy at the time, as Jordan had recently skipped the team trip to the White House. Though Jordan said he had committed to a family vacation, it was later revealed he spent the time gambling in South Carolina. The book surrounded the Bulls, defending NBA champions for the first time, with a new set of drama. And, according to Smith, the Tribune’s main competitor saw it as an opportunity to drive a wedge between players and his employer. Smith recalls the Sun-Times publishing almost daily, far reaching reports about the contents of the book after it was released, one in which former columnist Jay Mariotti went as far to claim that it detailed the sexual exploits of the players. Though there wasn’t a word along those lines in the book, the players were inevitably asked about it anyway. Perception became reality. The controversy, however, coupled with the Bulls’ rising success and popularity, only helped fuel book sales. Smith remembers his editors suggesting they send Mariotti champagne as a thank you for his efforts. After all, Smith and The Jordan Rules had found a spot on the New York Times bestseller list that lasted for three months. “This book was an effort to take people behind the scenes with a team, but not to embarrass anyone,” Smith contended. “This book is about basketball and what happens within a team and a league that draws the attention of millions. It`s an attempt to allow people to look behind those closed curtains of sport. And find what? “Human beings with everyday emotions trying to do their highly visible jobs as well as they can and confront the obstacles of their relationships and their very lucrative, very public profession,” Smith concluded. Despite Smith’s efforts, the crusade against his book continued. In addition to the Sun-Times, Smith recalls other media criticizing him on a regular basis, and various coaches—including former Bears coach Mike Ditka and former Kansas coach Roy Williams, an assistant while Jordan attended North Carolina—came to Jordan’s defense. The Bulls were on the road when the book was released. But, they were winning, off to a 15-2 start, which quickly dismissed a theory that the book would destroy the team and effectively end Chicago’s championship run after just a season. Recalling a practice he learned from his old editor Ernie Williams in Fort Wayne during his investigative reporter days, Smith knew what he had to do once the Bulls returned. “Every time I wrote a story, the day it came out, he made me go and see that person it was about,” said Smith, who had talked to Jordan in prior years about his fear of having his image damaged and subsequently losing endorsements. “I had to stand behind my work. So the first day the Bulls came back to town, I walked into the locker room and went right up to Jordan, who was sorting through his tickets. Smith credits Jordan a great deal for the way he acted—or didn’t act. 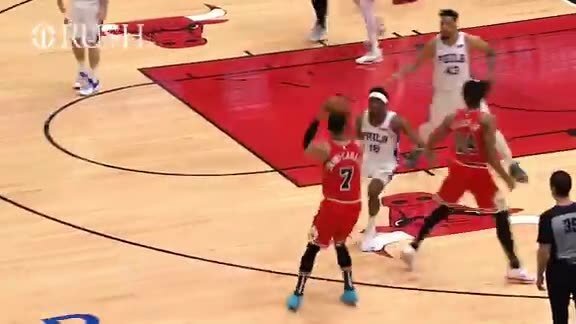 The fact that Jordan didn’t take any frustrations on Smith surrounding the book, coupled with the fact that the Bulls proved they could still win, took a great deal of pressure off the author. Despite the controversy and criticisms, both of which eventually calmed down, there were several positives that came with writing the book aside from it being a bestseller and placing Smith, as well as his work, into the national spotlight. For one, Smith was able to maintain great relationships with the vast majority of Bulls players because they saw he kept his word on what he would and wouldn’t write. He also believes that Jordan coming around to trust his teammates helped Jackson preserve the control he and his staff had over the team. In the end, The Jordan Rules sold over 200,000 copies in hard back and several hundred thousand more in paperback. Sam Smith covered the rest of the Bulls titles, a total of six in eight seasons to be exact. He prides himself on having personally seen Jordan play more than just about anyone on the planet. The late Johnny “Red” Kerr, a legendary Bulls figure, took in his fair share as well, but remained in Chicago during Jordan’s two-season Wizards tenure. Smith met his wife, Kathleen, during a weekend of active duty in 1975 as he finished his six-year commitment with the Army reserves. “Apparently, I looked dashing in uniform,” recalled Smith. As Smith points out, he was there for Jordan’s three “first” games in 1984 (as a rookie), 1995 (return from baseball), 2001 (last run with Washington), as well as his three “last” games in 1993, 1998 and 2003). In addition to The Jordan Rules, Smith wrote another book about the team in 1995, Second Coming: The Strange Odyssey of Michael Jordan. Smith and his wife, Kathleen, had started a family around this time with the birth of their son, Connor, in 1989. As Connor entered his teenage years, Sam and Kathleen decided it was time for him to have a younger sibling. They also shared a strong desire to help someone in need. So they researched their options for adoption and eventually came across a little girl in China named Hannah-Li. Hannah-Li was born with a cleft palate, but she was not afforded the opportunity to have surgery in her native land. She had been abandoned at birth and was being raised in an orphanage when Sam and Kathleen entered the picture. After a bureaucratic process that lasted over a year and a half, the couple finally adopted three-year old Hannah-Li in January 2004. Shortly thereafter, successful surgery was performed in the United States. After never hearing the English language, she learned it in her first 18 months with the Smiths. Today, at age 12, she’s happy, and most importantly, healthy. A few years after Hannah-Li’s arrival and a decade since the Bulls’ last championship, change came again in Smith’s professional life. This time, though, the change didn’t come because same wanted to face a new challenge. Rather, it was brought on as a product of his environment. The economics surrounding the Tribune and all newspapers had changed with the emergence of the Internet. Smith realized that opportunities in the industry were diminishing, and he had always promised himself that if a job became unpleasant, he’d get out. The work itself was still very enjoyable and rewarding, but the workplace was not, so Smith accepted a buyout. He decided that moving forward he would bank on his reputation in the business, as well as his resume, which included the two books and years as president of the Professional Basketball Writers Association. At the age of 60 in the fall of 2008, Smith did freelance writing for Sporting News and NBC, but had not landed a full-time job so he decided to reach out to the Bulls about a role with the team. In an email to Bulls EVP of Business Operations Steve Schanwald, Smith proposed essentially that he continued doing what he did for the Tribune on the team’s official site, Bulls.com. With newspapers cutting back, Smith saw it as an opportunity for the Bulls to direct fans to their own content. Sam and Kathleen, who reside in the west suburbs of Chicago, have two children: Connor, 23, and Hannah-Li, 12. From there, things moved quickly and within the next day or two, Smith, who had relocated to the Phoenix area, was on board with the Bulls. The accolades have certainly come over the years. Aside from the notoriety he gained as a national writer covering the world’s most well known athlete and a dynasty that will be remembered as the greatest in sports, there was the New York Times bestseller list, being named the inaugural winner of the Phil Jasner Lifetime Achievement Award in 2011, and now, set to receive the 2012 Curt Gowdy Media Award from the Naismith Memorial Basketball Hall of Fame. However, these are not roles that Smith has always embraced, at least not entirely comfortably. It simply doesn’t come with the territory, or shouldn’t, in theory. “It’s nice to get personal credit, but I’m generally pretty shy about it,” said Smith. “That’s what made The Jordan Rules so tough. You learn from the beginning in journalism that you are not the story. You’re told to stay out of the way, which I like. I became the story in 1991 and that was really uncomfortable, as well as contrary to the way I believe it should be. At 64, Smith doesn’t plan on slowing down anytime soon. He laughed as he recalled a line Bulls owner Jerry Reinsdorf enjoys referencing from when comedian George Burns turned 100. Burns was asked if he was finally going to retire. He said in response, “Retire to what?” It’s a sentiment that resonates with Smith.